There’s an air of renewal in Las Vegas. Building projects that stalled during the recession are back online, new sports teams are moving in and activities and neighborhoods that were previously overshadowed by the neon lights of the Strip are finding their day in the sun. Las Vegas is reinventing itself. There’s a reason Las Vegas’ motto remains “What Happens Here, Stays Here.” Once upon a time, this simple phrase represented the town’s reputation for over-the-top indulgence, but as the destination has redefined itself the motto has come to mean something much more. Because you can’t do what you do in Las Vegas anywhere else in the world. No other destination boasts such an abundance of varied cuisine options, access to astounding nature, cultural experiences and entertainment options like Las Vegas. And while the destination has long been shunted into one box, it’s breaking the mold with an offering of experiences that will appeal to everyone from the foodie to the nature lover. No matter who you are or where you come from, there’s something in Las Vegas that will tug on your senses. And since we can’t fit the destination into just one article, we’ve put together a series of itineraries for every kind of traveler in your group. Check out these specific itineraries or read on for an itinerary that will appeal to everyone! When you roll into Las Vegas, bypass the Strip and head straight for downtown. If you’ve been to Vegas before, you may not recognize the area which was once a no-man’s land that tourists avoided at all costs. These days, however, downtown is thrumming with a youthful energy and it’s THE place to be for locals and laid-back travelers alike. Grab lunch at Park on Fremont, a tasty gastropub with unique decor and a delightful patio that sits right across from the entrance to the Fremont Street Experience. After lunch, hit the pavement and explore 18B, the arts district that is home to some incredible street art from artists around the world. Go hunting for murals, most of which came to the area as part of the Life is Beautiful festival. Then skip over to the Mob Museum, which teaches you as much about the birth of Las Vegas as it does the history of organized crime in America. When your feet get tired, stop for drinks at the Container Park’sOak and Ivy. Staffed by a group of friendly mixologists, this spot is small and cozy, and offers the most authentic drinking experience in Las Vegas. 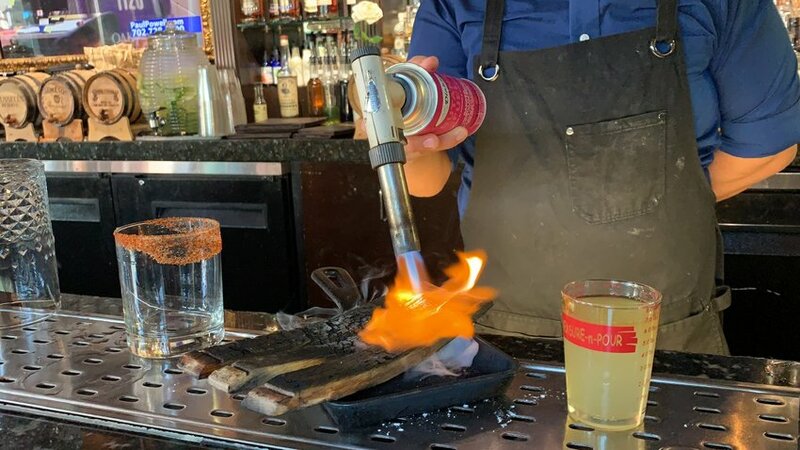 Skip the outdoor patio and sit at the bar to get a front-row view to the show as these mixologists whip up crafty, cool and, most importantly, delicious drinks. From barrel-aged whisky to homemade ginger beer, the rotating drinks on the menu will delight your senses. And if you don’t know what you want, just ask the mixologist and they’ll craft something special. For dinner, it’s time to indulge at Harvest, the Bellaggio’s ultra-sustainable dining concept. Head Chef Roy Ellamar hails from Hawaii and brings a respect for the land and natural ingredients to every dish and cocktail. From drinks that look like an herb garden to plates filled with local ingredients, it’s just the meal to welcome you to the new Las Vegas dining scene. Don’t forget to take advantage of the Snack Wagon which features off-menu treats from guest chefs. When the lights go down, head to the Neon Museum, a graveyard of old neon signs from the Las Vegas Strip’s colorful history. Join the tour to learn incredible stories behind the Strip’s many famous residents and watering holes throughout the years. No need to wake up early in Las Vegas, but if you find yourself wide-eyed and hungry, head to Primrose in Park MGM for some of the fluffiest pancakes you’ve ever tried (and the best vanilla latte this author has ever tasted). Don’t linger too long, because you have a full day ahead. 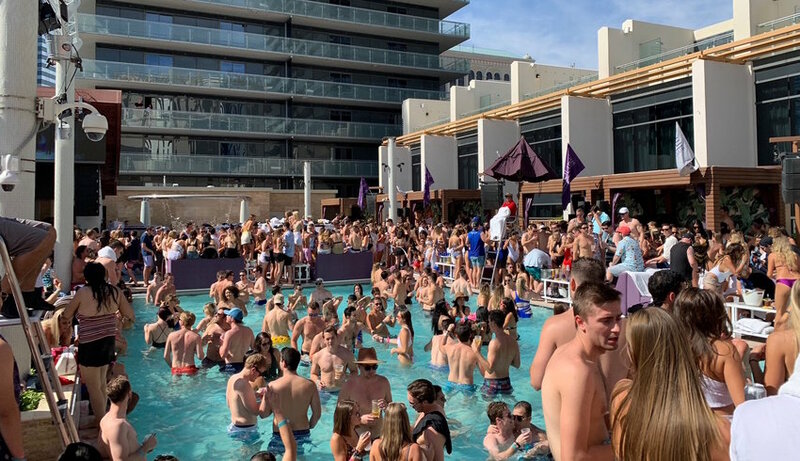 The Las Vegas pool party is a rite of passage for visitors, especially since the destination’s near-constant sunshine offers perfect conditions all year long. The atmosphere is impossibly fun with well-known DJs spinning hits that will make you want to dance. There are tons of options, from MGM Grand’s Wet Republic to the Marquee at Cosmopolitan. Rest up after the party, and then head over to the High Roller Ferris Wheel at The LINQ before dinner. If you time it right, you can watch the sunset and the lights of the Strip turning on during the 30-minute ride. 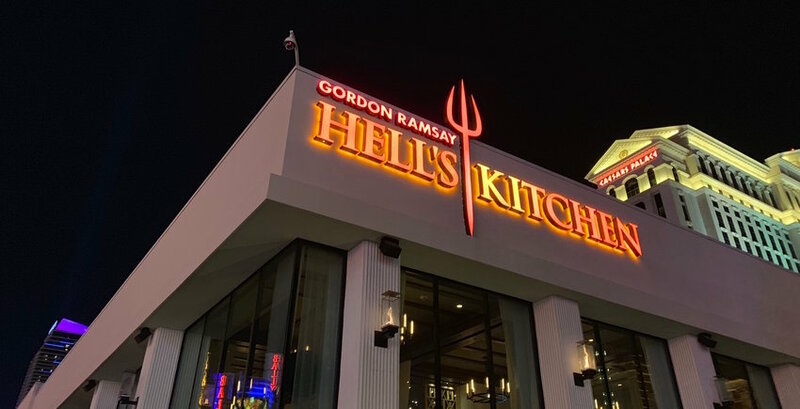 When you disembark, walk over to HELL’S KITCHEN, chef Gordon Ramsay’s place overseen by recent show winner Michelle Tribble. Not only will you get to sample famous dishes from the hot-tempered chef (seriously, the sticky toffee pudding is to die for), but you’ll also get treated to new concoctions from the red and blue teams working the kitchen. Did you get enough sleep? Hope so, because it’s time to get moving on your last day. Get up early and head out to nearby Red Rocks Canyon for a morning hike. 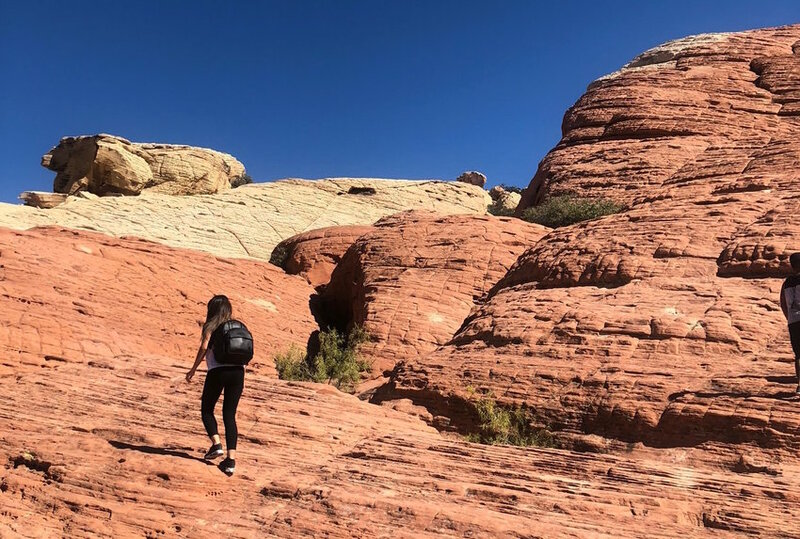 The Calico Tanks Trail is perfect for first-timers, or if you’re not up to hiking, drive the scenic loop for some stunning photo opps before you grab your bags and head to the airport. With the most hotel rooms in the world, Las Vegas has no shortage of places to stay. Classics like Caesars Palace and The Bellagio will always draw crowds, but there are a few new(ish) spots that you should consider. If you noticed the Monte Carlo was missing from the Strip, don’t panic. It’s been reconceptualized as Park MGM, inspired by urban parks and the elegance of classic New York. With a massive Eataly on the way, this hotel is a great spot if you want to try something new. The Cosmopolitan is another fan favorite featuring ultra-modern design, a hub of food options and easy access to other hotels along the Strip.